Capricorn Beach is a unique coastal community surrounded by pristine white beaches, beautiful parks with mature shady trees, and fully established amenities such as schools, shops, cafes, restaurants and recreational facilities. Campground Adventure Park is a 2.4 hectare centerpiece parkland with adventure play equipment and family picnic areas. Yanchep’s only beachfront estate boasts a picturesque stretch of pristine white beaches. Perfect for swimming, snorkeling and fishing or simply relaxing with family and friends. Patrolled by the Surf Life Saving service, Yanchep Lagoon is by far the most popular swimming and snorkeling spot for locals. Capricorn Beach offers an abundance of beautiful open spaces and established parks with our signature mature shady trees to relax and play under. Just a short drive away from the historic Yanchep National Park, featuring more than 400 caves, a museum, BBQ facilities, native animals and a number of walking trails, our parks suit everyone. 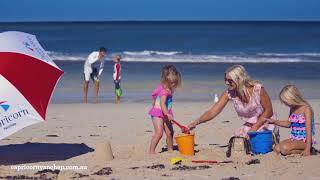 Capricorn Beach features lots of fantastic play equipment to encourage imaginative activities for younger family members. With tennis courts, footy goals, walkways and public art installations, your kids will never be far from something fun to do in this beautiful area. Living at Capricorn Beach means you can enjoy the relaxed coastal lifestyle and still have access to outstanding education opportunities for your children. With two early learning centres, after-hours childcare facilities, a primary school and a brand new district high school nearby, Capricorn Beach is the perfect place to raise your family. 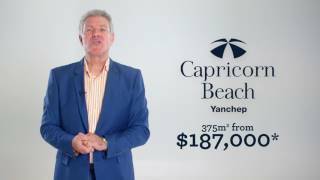 The best part about joining us at Capricorn Beach is that the estate is part of the thriving Yanchep community. Everything your family could need and want is already here. There is a fantastic range of excellent shops and cafes to choose from, offering great food and coffee. We also have an established local medical centre and dentist available. While our community is well established, we still have some exciting and unique developments planned in the very near future. Facilities such as the foreshore park, grassed and terraced picnic areas, as well as beach access boardwalks are on their way, and we can't wait to welcome you into our vibrant community. Capricorn Beach is waiting for you!